Pituitary gland is found at the bottom of your brain and is shaped like a peanut. It may be small in size, but it's pretty big in importance. One of the chemical messengers the pituitary gland sends out to your body is called growth hormone, which is essential for growth. The picture of left side is Tumor of the pituitary gland (Craniopharyngioma) leading to deficiency of hormones of pituitary glands. 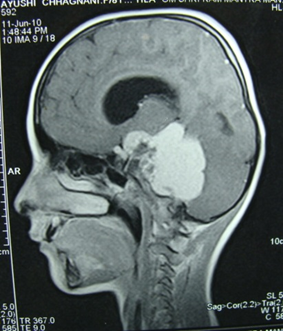 Disorders of pituitary gland include small sized gland by birth or destruction of the gland by any condition. Special tests can find out if the pituitary gland doesn't produce enough hormones. If they don't, daily shots of growth hormone can often help them grow to be normal-sized adults. Kids with hypothyroidism tend to feel tired and not have much energy. Their hearts might beat slower and they may feel cold when the temperature of the room is comfortable for everyone else. Their hair may become brittle and break off more easily, and their skin may be dry and look pale and yellowish. Constipation (infrequent, hard bowel movements) can be a problem. Kids with hypothyroidism tend to grow more slowly and may not show the changes of puberty until they receive treatment. The doctor may suspect hypothyroidism if he or she sees that a kid's growth is not staying on track on the growth charts. Although kids with hypothyroidism may tend to gain weight more easily, thyroid disease is almost never the cause of the problem in kids who are overweight. A goiter is another symptom of thyroid disease. A goiter results when the thyroid gland gets swollen, or enlarged. Hypothyroidism is easy to treat. Kids with this disease will have to take a pill every day, but their symptoms will go away. They'll usually need to take this medicine for the rest of their lives, but it's a simple way to make sure the body has enough thyroid hormone to grow and develop normally. Blood tests are also done to diagnose hypothyroidism. All babies should be tested for hypothyroidism right after they're born, even if they don't have symptoms. It's important to treat a baby with hypothyroidism in the first few weeks of life. Otherwise, the baby won't grow and develop normally.